Upon the recommendation of some friends, we recently tried La Fiesta Mexican Restaurant in Longwood. 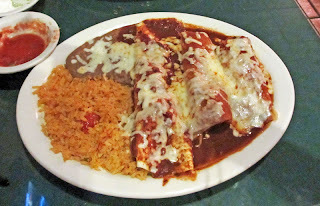 It was a good recommendation, I cannot remember when I last had such good Mexican food in the central Florida area. This place is one to bookmark and return to, again and again! We arrived about 7 on a very rainy Friday evening. There were not a lot of people, there but it is a big place and they had steady traffic, given the rainy evening. We were promptly greeted and seated, and our waitress promptly appeared with some chips and salsa (and the chips were nice and warm, nice!). We were wisely served with a small carafe of salsa and two small bowl. I say wisely because that allowed me to kick mine up a notch with some Tabasco while my friend Tommy was able to enjoy his more mellow, mild preference for salsa. 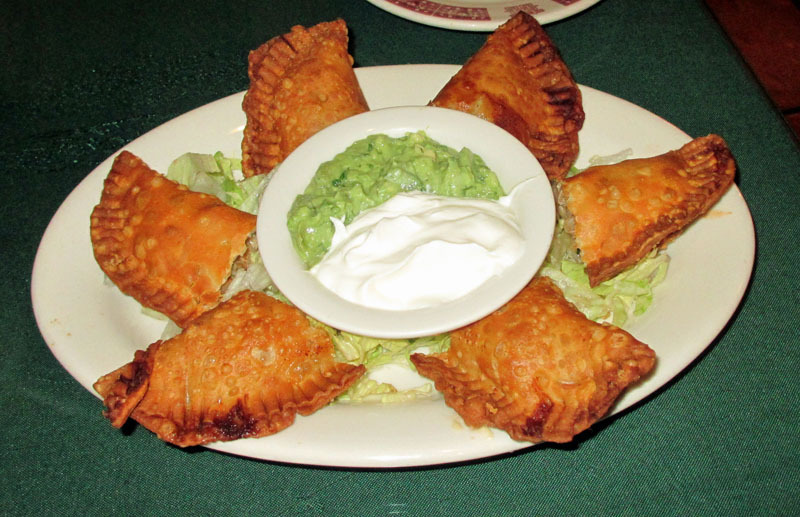 We began with an appetizer, the Shrimp Empanadas. They were very good. Three large empanadas were stuffed with a very decent portion of shrimp along with some crab and, I'm sure, other goodies, then deep fried. Now, I will say, they were fried just a bit too much and would have been even better if they'd been removed a bit quicker. But, outside of the slightly overcooked outer edges, the empanadas themselves were excellent. They had a great shrimp flavor with just a hint of crab. The guacamole served with them was also excellent, tasting primarily of avocado, a bit of onion, and cilantro. I'm guessing there was a bit of lime juice and maybe some garlic, too, but they did not overpower the nice "guac" flavor. These were a hit! For his entree, my friend Tommy had the Chimichangas. Two large chimis were stuffed with a very flavorful beef filling and fried perfectly, topped with some melted cheese and served with rice and beans, as well as a few other dressings. I had a bite, and this was very, very good. Tommy agreed. The beef filling was flavorful, the chimi cooked just right, and the rest o f the go-withs just added to a nice meal. Yumm. 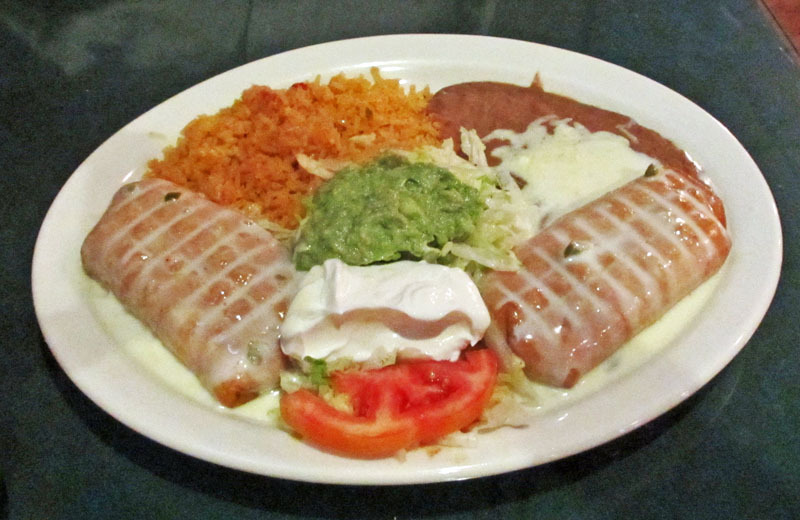 I ordered the La Fiesta Grande, a combo where you can pick three items from a list. I chose chicken for a burrito and an enchilada, as well as a pork tamale. All I can say is, "wow." This was really good. Not fancy, not gourmet, but excellent Mexican food for a very decent price. The portion was large and I enjoyed every bit--and no, I did not eat it all in one sitting! The rice and beans that went with it were pretty standard fare, but good. The rest of the dish was covered in a very tasty red sauce. The hint of vinegar/acid in it was wonderful. It was a great compliment to the rest of the items. The burrito was stuffed with tender, moist, shredded chicken. The enchilada had some larger chunk of chicken. Both had a nice chicken flavor to them and were tasty. The pork tamale boasted than nice corn flavor a tamale should have--it was well done and the pork was tender and juicy. We both enjoyed our meal here thoroughly, food, service, ambiance, and price. We both agree, we'll be back here--we have not found a lot of good Mexican food in central Florida (outside of two great places in Daytona Beach--a bit of a drive for us). We'll be back, for sure, and I suggest you give this place a try and tell me what you think! We decided to give Quickfire Sub Station a try on a recent Friday night, based on some good reviews on Urbanspoon. However, I'm not sure I went to the right place. What I found was food swimming in salt, and that was disappointing. There was some good, but overall, based on price, service, and taste, I do not plan on returning. More about what we were charged in a bit. First off, the food. Well, I ordered the Train Wreck (small) and the combo, so also a Tortilla Soup and a drink. The first thing I tasted was the Tortilla Soup. It left me wondering if the cook tastes what they make and server. The overwhelming taste was salt. I could detect some beef (I guess) base in the background, but mostly I tasted salt. They claimed that there was a bit of a spice to the soup, but all i tasted was salt. It was below average. The sandwich was OK, but just OK. There was a lot to it and a lot of flavors, bacon, ham, turkey, etc. It was a bit messy to eat--actually, a lot messy--but overall, pretty tasty. For $5.99 I would say it's a value. 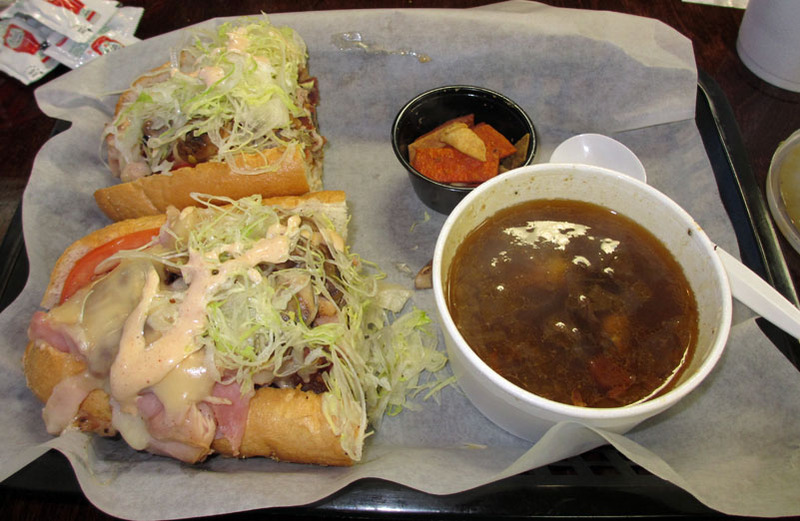 My friend Tommy had the french dip and Chicken soup, also ordering the combo. His soup was OK, nothing spectacular, but at least not wildly oversalted. Unfortunately, the french dip itself, the jus, was very salty and not very appetizing. His roast beef, supposedly homemade, was just average at best. It was well done, not what i'd expect from homemade roast beef. Perhaps the best part of the meal would have been the french fries, had they been a little less salted. Again with the salt! They were hot and fresh, seasoned fries. They were pretty good if you could get past the salt. My big suggestion to this family run business: get the salt in hand, taste the food, and put a salt shaker on the table. Under-salted is better than oversalted, and most of what I had here was way over-salted, pure and simple. The service was OK but certainly not stellar. The table we sat at needed cleaning, and in the whole time we were there, I did not once see anyone cleaning any of the empty tables. We paid $22.24 before tax for what we had. In looking at my receipt this morning, it just does not add up for what we ordered. In other words, it was not rung up correctly and we ended up overcharged. We had two small subs at $5.99 each. We each added the combo (we had soup) for another $3.49 each. And we added a small order of fries for $1.99. The receipt, however, only shows one combo soup (comes with a drink) at $3.49. Then it shows another soup at $2.99 and a drink at $1.79 (the combo comes with a drink). So, we were overcharged by $1.29, plus tax. That does not inspire confidence in me. Overall, I was not that impressed. Perhaps if they tasted their food, paid a bit more attention to employee training on the register, paid more attention to keeping the dining area clean, and laid off on the salt and tasted everything, it would have been a better experience. However, this is an independently owned, family run business, according to their web site. It's fairly new. Maybe there are just a few kinks to work out. I hope so and I hope they succeed. I invite you to give it a try and see what you think. Feel free to comment here or write your own review on Urbanspoon.com. My friend Tommy and I attended the 4th Taste of Sanford recently. We had gone to the first one in 2009, so this was our second year. Of course it's all about "taste" and so I'll talk about the food, first and foremost, before I come to some aspects of the event that I had a few questions and doubts about. So on to the food. The best bite I had that was from a Sanford Restaurant was from a newcomer, the new kid on the block, Breezeway Restaurant and Bar in historic downtown Sanford. They had some firecracker shrimp that were awesome. Over the course of several months, we watched as the space formerly occupied by Two Blondes and a Shrimp was transformed into the Breezeway. We have eaten there three times now and enjoyed each meal. I've even blogged about Breezeway. So i was not surprised to find that their Firecracker Shrimp were good---very good. I know now what my appetizer will be the next time I go there. Only one complaint, Steve: how about a web site? Time to enter this century and get your presence known on the web. But this was the best Sanford bite I had. However, there was a bite that was even better, but it was not a Sanford Restaurant. Still the best thing I had for the evening was from Shula's 347 Grill located in the Westin Hotel in Lake Mary. They had two bites that were great, but the crab cake was truly exceptional--it was almost all crab. I loved it. Their second bite was tender beef (probably short ribs is my guess) served over mashed potatoes. Again, quite a good bite. 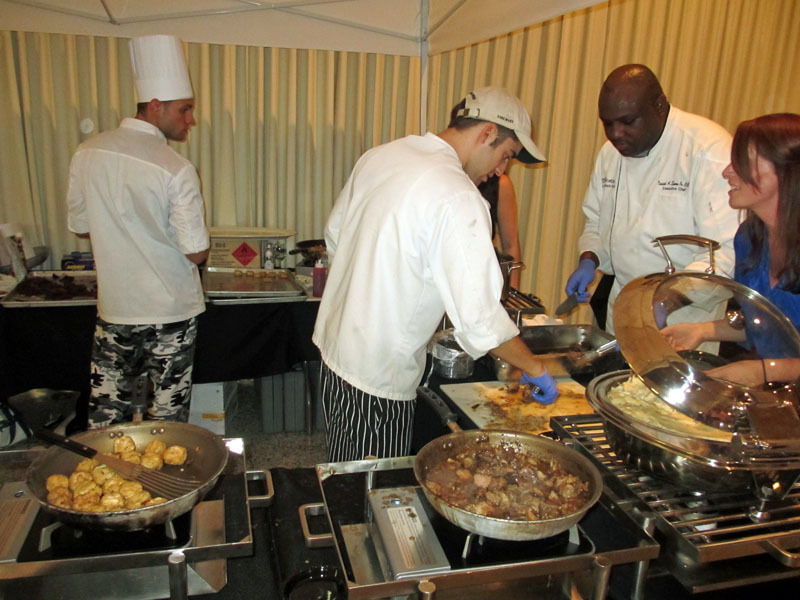 Based on this, I have to say that without a doubt, the best of Taste of Sanford was the food from Shula's 347 Grill. Based on that experience, I know I will be going there for dinner some time soon and then writing about it here in my blog. And, they did a great job of promoting themselves. Nice job! I'll be seeing you soon! There were a number of other bites that I found good, and I'd say most places there brought their "A" game to the table (pun intended). Chef Michael, owner of Corner Cafe Home of Gourmet 2 Go had a great vegetable soup that was rich and velvety with tasty chunks of veggies in it. I have eaten at Corner Cafe a number of times and have never been disappointed. Buck's Restaurant and Catering had a nice smoked fish dip. 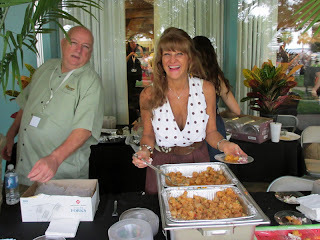 I have eaten at the restaurant and was not a big fan, but I can say that when I've had some of their food at an event like this or at the monthly Alive After Five, it has always been very good. I think maybe their catering is much better than their restaurant, at least that's been my experience. Then again, you should try the restaurant and make up your own mind! Among the other good "Sanford" bites was Father's Table and the Ale House. There were some good drinks, too, with Tim's wine (yummy Cabernet) and cold beer from Wayne Densch, and even great desserts, like the bite from Empress Sissi (I think that's who had that good cheesecake). Lots of good eats and we sure got stuffed. There were also a number of other non-Sanford places in attendance and, to some extent, that confused me. I mean, it's called "Taste of Sanford" and yet i was tasting food from as far away as Deland and from the Universal Studios area. What's with that? 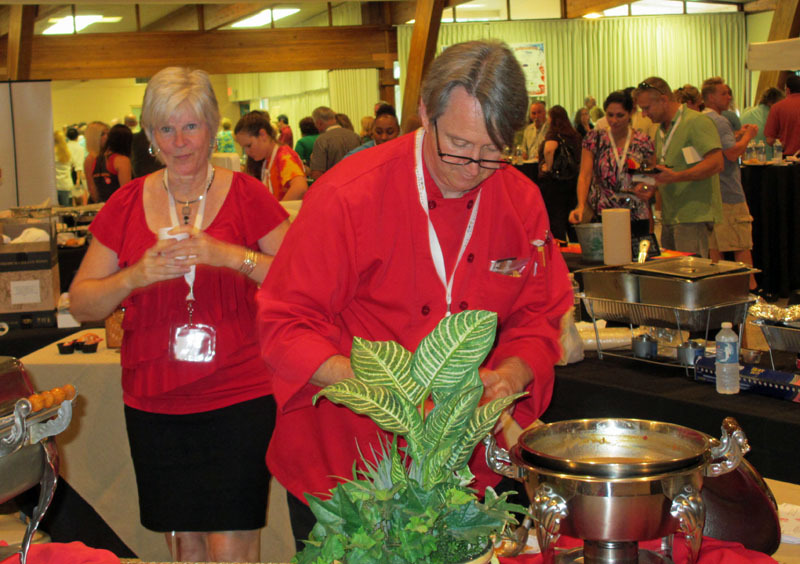 I really think that a "Taste of Sanford" should be that. 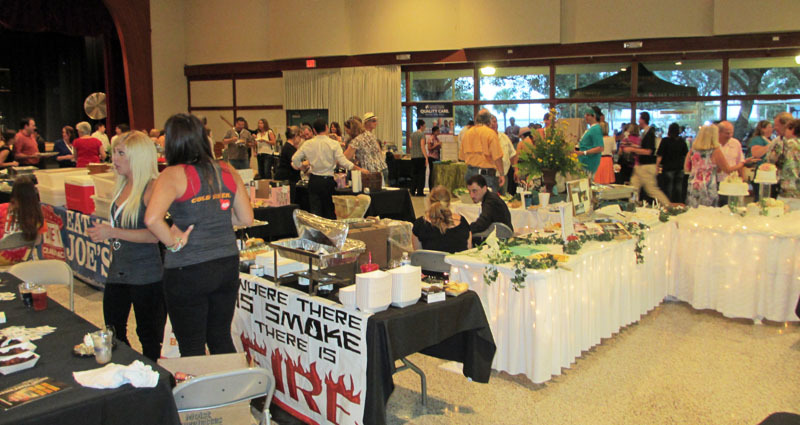 I did hear a few words from some of our friends at other places in Sanford, members of the Chamber who did not attend Taste of Sanford. Their take on it seemed to be that the Chamber wanted top dollar from local businesses, and was more interested in promoting out of the area and getting merchants who'd pay bigger bucks, rather than local folk. The setting for Taste of Sanford was nice, at the Civic Center. The inside was crowded early on, but thinned out a bit later. The evening was very nice and so sitting outside was also a pleasure with the big grassy area right behind, and a few vendors set up in that area. 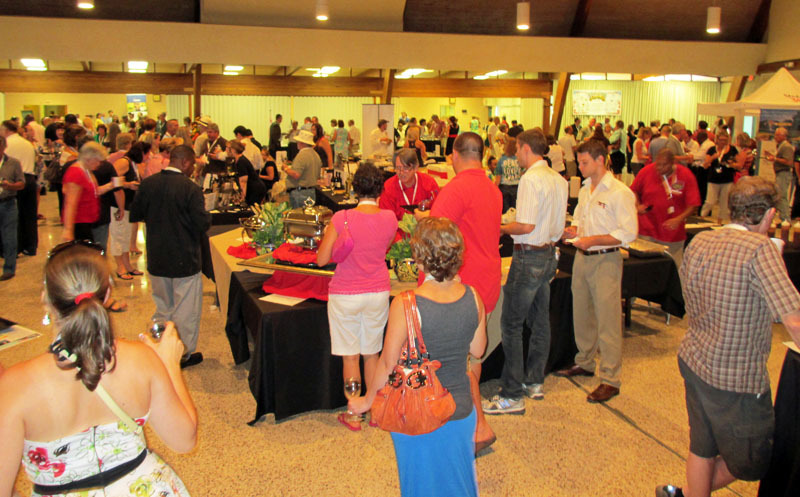 There were no long lines or large waits like there are at other "taste of" events, and that's a good thing. It's nice to be able to walk around, see what there is, talk to merchants and vendors, and get what you want promptly, I like that a lot. Three years ago, Taste of Sanford cost me $35 for a couple ($20 individual), this year it was a flat $25 per person. So the price has gone up a bit. Given the fact that there were so few real local Sanford restaurants in attendance, I was a bit disappointed. I'd have liked to have sampled something from some other very local places like Marco Dino's, Angel's Soulfood, Cafe Rouge, Hollerbach's Willow Tree, and Riverwalk Pizza, just to name a few. I'm a big fan of local places rather than chains, yet there were a few chains there. Not that they have bad food, but I prefer the fresh ideas that local "mom and pop" places produce. So, for me, it was an OK experience, but just a bit of a disappointment. I mean, the food from Shula's in Lake Mary was outstanding, there was good stuff from the Debary Country Club and from De La Vega in Deland. Four Rivers from Longwood was good (but why is the "pulled" chicken then chopped so fine?) and Mr. Ted's from way down in Orlando on Kirkman had good stuff as well. But for my money, shouldn't the Sanford Chamber of Commerce strive more to promote Sanford and even at least, Seminole County Businesses? But I guess that's a matter for the members of the Chamber to take up. Overall, this was a nice and fun event, it was a good "Taste of" Sanford and central Florida. Will I go back next year? Probably, probably. But I'd like to see a few more local Sanford places there too!